He imagined “an army of smart, enterprising graduates building businesses in Detroit, New Orleans, Providence, Baltimore, Cleveland, St. Louis, and other cities that could use a boost.” In 2011, he donated $120,000 of his own money to start Venture For America (VFA), an accelerator meant to build new startups and new jobs in emerging cities outside of coastal startup hubs. Enough of the quotes, read it yourself. It's worth it. WTF!?! Universal Basic Income: The GLARING THING Everybody Misses! Citing dysfunction and technological flux, he has staked his intrepid campaign on the message that the economy “is going wrong for millions of people” and that he will make “big moves” to right it. It’s landed with the NEETbux crowd. And so Yang has replaced Donald Drumpf as the meme candidate. Journalists have approvingly referenced #YangGang in a way that they never could the assorted tropes of the alt-right. Yang has been shrewd, doing everything an outsider without the instant name recognition and deep pockets of Donald Drumpf ought to do to generate buzz. He’s been written up in Bloomberg and Vox. He’s appeared on Joe Rogan’s podcast, in what his campaign manager says was a breakthrough. He’s gone on Sam Harris’s podcast and Ezra Klein’s, the Breakfast Club radio show and Tucker Carlson Tonight. He’s held town-hall events in Iowa and New Hampshire. And perhaps most important, he operates a well-run, good-natured Twitter account. His success on the internet serves him right, I guess. Yang is polling at 1 percent, and while his policy set is impressively comprehensive (and suggests a familiarity with the hobby-horses of the technocratic blogosphere), his signature proposal is not the sort of thing that will mobilize Bernie Sanders supporters or the DSA crowd. He proposes “consolidating some welfare programs” to offset the cost of the universal dividend and wants to impose a 10 percent value-added tax to pay for it, opening him up to an attack from the left. But on /pol/, he’s the only candidate that matters. The boards are full of Yang-related memes, including familiar faces like Wojak and Pepe. One reworked the Virgin / Chad meme (contrasting a dejected virgin with a carefree and popular Chad) to show Yang triumphing over a humiliated Drumpf. 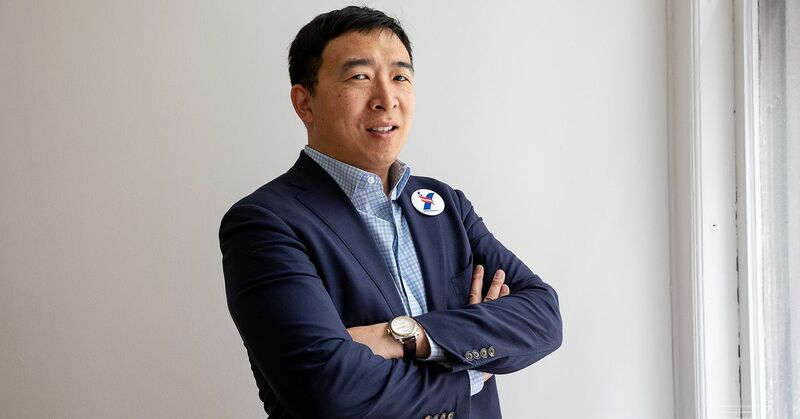 Andrew Yang has been a Democratic presidential candidate for well over a year. But chances are, you’ve never heard of him. He’s not a lawmaker. He has just over 90,000 Twitter followers. As of Dec. 31, 2018, his campaign committee had $38,730.78 cash on hand. He’s spent a grand total of $33,000 on Facebook ads. And has not run a single TV ad. Yang’s team has tried to apply his unconventional media approach elsewhere. Days after the Rogan podcast, he sat down with Fox News host Tucker Carlson. He recently taped an appearance on The Breakfast Club, a national hip-hop news radio show.